While some dieters adamantly refuse to accept a snack or sneak an occasional one and then feel extremely guilty about it after, others are quite happy to snack when they feel the urge. In actual fact there is nothing wrong with snacking between meals. In fact, it can actually help you to keep your calorie controlled diet on the lean tracks, so long as your snacks are light and healthy. Here are some healthy options for light snacks between meals. 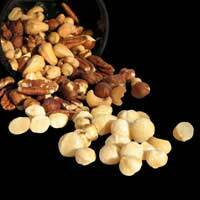 Nuts and seeds, although calorie-dense, are great snack-options for dieters. Just keep your portions small. Not only do they satisfy your appetite, they are packed with healthful vitamins, minerals and fibre. They also provide protein which can help you stay fuller longer. Whole-grain snacks are rich in fibre and complex carbohydrates, which give you energy that has some staying power. Look for items such as low-fat whole-grain crackers, whole-grain pretzels and whole-grain crisp breads. Eating fruits and vegetables provides a feeling of fullness with no fat and only a small number of calories. They also provide vitamins, minerals, fibre and other nutrients. Low fat cheese, yogurt and other dairy products are good sources of calcium and protein, plus a variety of other vitamins and minerals. Dairy products can be high in fat, so choose the low-fat versions. Some yogurts have a lot of added sugar, so opt for light yogurt if you want to limit your calorie intake. Enjoy a small baked potato topped with fat free cottage cheese or fat free sour cream. Sprinkle on some chopped basil or oregano to give it s little extra flavour, or a little minced garlic to kick your metabolism up a notch. Hollow out a red or green pepper and stuff it with boiled rice, raisins and chopped tomatoes. You can add any combination of herbs and spices from ginger, garlic and turmeric to basil sage and thyme, depending on your mood. Mash half a banana into 2 teaspoons peanut butter and spread onto a whole-grain bagel. Large bagels contain up to 400 calories, so choose a smaller bagel. Lightly spread some hummus on whole wheat pita bread. Mix up a smoothie with non-fat milk and your favourite fresh fruit. Chop up one whole egg and one egg white, then mix with a tablespoon of reduced fat mayonnaise. The high-quality protein in the eggs will fuel your body for hours, while the fat helps slow digestion, so you'll feel full and energised longer. Keep a fresh green salad on hand in your fridge then when you feel the hunger pangs you can snack on it too your hearts content without piling on the extra pounds. Just remember to stick to a fat free dressing and you'll be fine.